The one Disney movie we could watch over and over again and never get tired of is Disney’s Beauty and the Beast. The original animated film that debuted in 1991 will always be a favorite classic, but we were extremely impressed with the live action film of Beauty and the Beast released in 2017. Both bring the beauty of true love front and center with a perfect twist of mystery, fantasy, and the unexpected every good romance should have! When we learned there was a live Broadway-style performance of Beauty and the Beaston the Disney Dream Cruise Line, we assumed it would be much like Disney’s Hollywood Studios Beauty and the Beast Live on Stage. It, in fact, is nothing like this version. 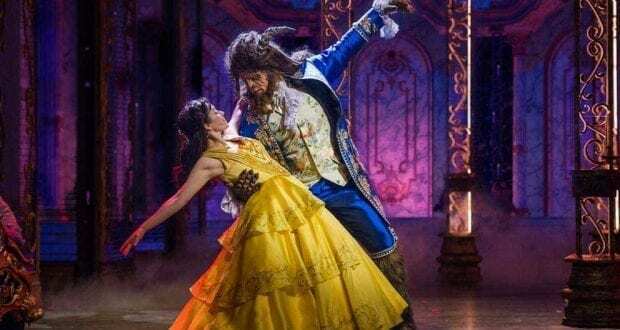 Beauty and the Beaston the Disney Dream is an extremely high-end performance that follows the path of the Beauty and the Beast live action film that was released in 2017. With that being said, this performance truly is unlike the films or other performances as it is entirely unique to the Disney Dream. There are two set dining times for dinner on the cruise, so typically guests go to the theatre the opposite time to watch the performances which are presented two times daily. Beauty and the Beast was the exception however as they released a matinee show as well. While Cast Members were still advising that guests arrive early for the show, the matinee time frame did help alleviate the standing room only issue they have had on previous cruises for the Beauty and the Beast production. We chose the matinee which had empty seats but not as many as one would suspect. We were reminded upon arrival that no photos or filming are allowed in the Walt Disney Theatre! (The images in the article are from Disney and are used with permission). We saw one woman with a phone out and a Cast Member almost instantly standing next to her asking her to put her phone away. We were also told from a regular cruise guest that they typically provide a playbill for the performances of Beauty and the Beast, but they were not available on our cruise. 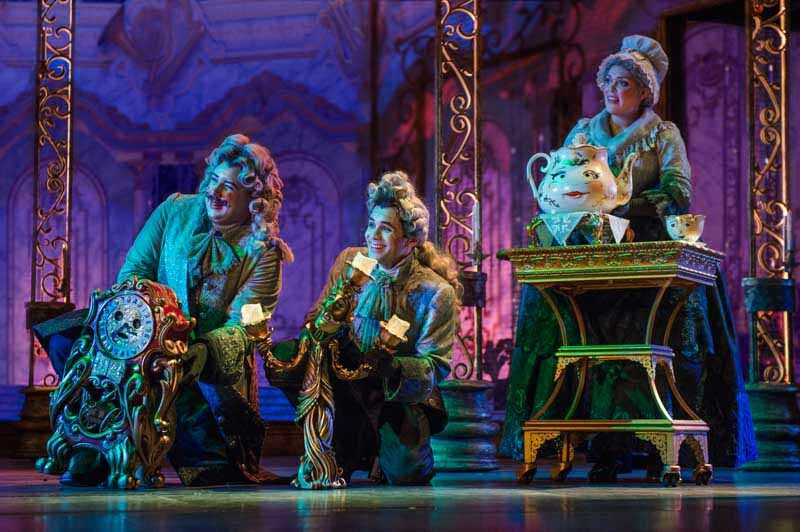 Chances are you know how the Beauty and the Beast story goes, but we will still try not to give out too many spoilers for the Disney Dream Beauty and the Beast. There are an impressive fourteen scenes along with the opening Prologue. The Prologue to our surprise began with Maurice and his music box. The lights were dim, the spotlight was on Maurice, and his singing voice immediately made the crowd noise fall silent. While sitting in this huge theatre on a massive ship, it was probably the most intimate moment of the entire performance. Right away we knew the costuming, stage lights, and performers were going to be at their most impressive stature for this performance. That belief didn’t disappoint as the scenes rolled on. 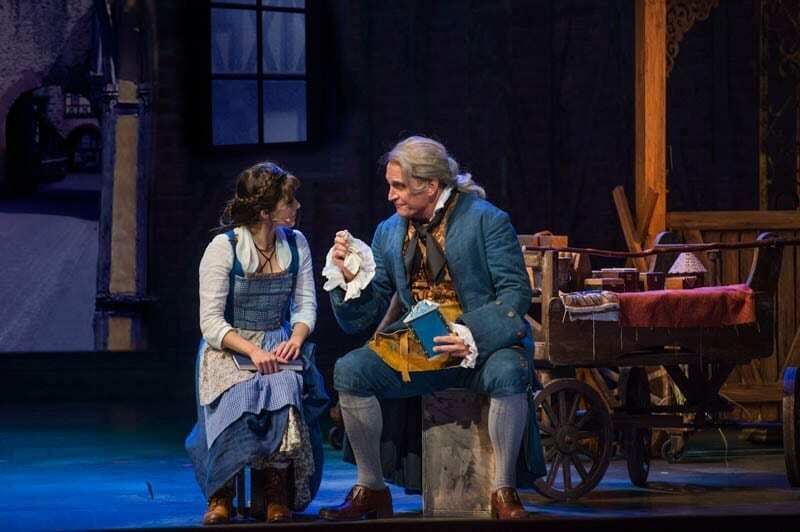 Belle is the star of the performance with her independent yet innocent personality shining through. Her voice was outstanding, and she truly embodied the Belle personality we all know and love in every way. Belle is constantly battling Gaston’s not-so-humble advances with great ease. LeFou is a perfect dose of comic relief as he is clumsy, loud, and eager for Gaston’s approval. There are several town people, and while you know it’s the same performers again and again in different roles, it truly feels like a town full of people. As you enter Beast’s Castle in Scene 4, you’ll see the puppetry unfold with favorite characters like Lumiere, Mrs. Potts, Clogsworth and Lumiere’s feather duster girlfriend. We typically aren’t big fans when puppetry is involved, but wow! The performers were dressed the part of the characters as well, and they interacted with their puppet as if it was part of themselves. Then, of course, you have another star performer, the Beast. It’s hard to describe his costume as it is so amazingly done! It’s truly a transformation of a man into a beast. It’s not the boxy or clumpy Beast costume you may find if you see Beast at Disney’s Hollywood Studios or during a Be Our Guest dinner at Magic Kingdom. It’s form fitting, moves with the performer, powerful, and hard to understand how they accomplished such an extraordinary costume. The scene changes stood out to us as they were done with flawless perfection. From massive props that slide away almost without notice, to rising and lowering floors that characters disappeared into, and the incredible projection lighting – the scenes really felt alive right along with the performers. In Scene 7, the famous “Be Our Guest” song makes for a lively scene full of excellent music, extravagant costume changes, and a lot to watch all at once! This was the most uplifting part of the performance and had the kids especially excited to watch. As this scene ends you begin to enter the West Wing Scene 8 and into the Wolf Attack in Scene 9. There were so many up and down moments that dramatically play with your emotions through the singing, stage props, and lighting. We went from laughing to crying and just about everything in between! By the time you reach Scene 13, the battle between Gaston and Beast will have you on the edge of your seat. This is executed in perfect timing as props are moving around at fast speeds, yet performers accomplish it with what looks like such great ease allowing for the battle to be at the forefront of your mind. There was even a very brief, slow-motion moment which we still are scratching our heads as to how they pulled off a live production with the whole audience understanding it was slow-motion. Finally, you reach the highlight of the production in our opinion – the transformation of the Beast back into a Prince. We genuinely don’t understand the logistics to how they pulled it off, but the Beast rose in the air, was stripped of the Beast he was and became his former Prince self. This isn’t your typically smoke and performer change. We feel it is moments like this that are the reason they don’t allow photography or videos as lighting could ruin the unveiling. We’ll be honest, we did cry at the end as the transformation begins for all the characters (even Chip turns into a boy again!). Located on Deck 3 Forward, you’ll find the beautiful Walt Disney Theatre where multiple Broadway-style shows take place throughout your cruise itinerary aboard the Disney Dream. The theatre has a 1,340-seat capacity which was never completely full during our visits. Floor seating is available on Deck 3, but you’ll also find balcony seating accessible from Deck 4 or from the floor seating stairs on Deck 3. To our surprise, there really isn’t a bad seat in the theatre! The theatre doors open 30-minutes before showtime, so we were sure to arrive when they opened for great seats. We sat in multiple areas during the different shows but found our favorite seats to be on floor level in the center. There are a few surprises (such as bubbles) for some of the shows that only hit this area of the theatre, so our kids enjoyed that. We also sat in the balcony orchestra seating for one of the performances and felt like VIP there. Be aware with balcony seating, the railing may block views for smaller children. If you’re looking to be close to the action on stage, sit in the very front right side. Many characters entered and exited in this area, so you’ll get an up-close view of the performers. Refreshments can be purchased at refreshment stands called Preludes. These can be found at both the left and the right entrances on Deck 3. You can also find a refreshment spot located on Deck 4 for balcony seating guests located near the Buena Vista Theatre. These refreshments are an extra fee and include items such as popcorn, canned sodas, bottled water, candy bars, and beer. Tip –if you’re planning on enjoying popcorn more than once, you may want to look at purchasing a popcorn bucket as refills are cheaper than buying a new popcorn each time. Remember, no photography or videoing is allowed during the shows so be prepared to let these performances form a memory you’ll want to hold on to for years to come!